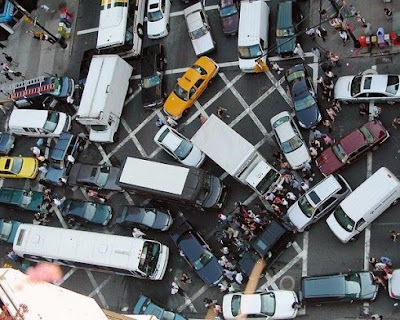 Physics Buzz: What Causes Traffic Gridlock? New model suggests mass-vehicle slowdown, triggered by decelerating vehicle, spawns traffic impasse. Everyday life enters a different phase on the Tuesday after Labor Day, the unofficial start of autumn in the United States. As students and employees return from vacation, and vehicles fully flood roadways once again, drivers face an increased risk of what may be the worst hassle a commuter can encounter: traffic gridlock. Gridlock occurs when vehicles cannot pass through an intersection -- even if they have a green light and the right of way. Vehicles that were unable to make it completely through the traffic signal before the light turned red now block the "box" -- the area of the intersection where both roads overlap -- causing delays and unnerving blares from car horns. Greg Mitchell, a manufacturer’s representative from the Bronx who has driven in New York City for 20 years, has experienced gridlock many times when driving between sales calls in Manhattan. "It's frustrating when you're at an intersection and you see vehicles in the intersection that shouldn't be," Mitchell said. "On the other hand, I don't want to be the guy sitting in the middle of an intersection when the light changes to red and the cross-traffic is sitting there, aimed at my driver's side door, honking their horns. That’s not a fun feeling either." Striving to figure out how to prevent this urban nuisance, traffic-physics researcher Boris Kerner of the Daimler Automotive Group in Germany has developed an explanation for how gridlock occurs. A preprint of his new model can be viewed at the website arXiv. Surprisingly, his new model suggests gridlock can occur even when traffic flow is relatively light. The culprit? Someone in the line of traffic near a light signal slows down, triggering a chain of events that can reduce the speed of all traffic behind it, build up successively longer lines of vehicles with every green-yellow-red cycle, and eventually lead to gridlock. Continuing a physics approach that originates from the early 1960s, Kerner and his colleagues developed a mathematical description that treats vehicles in traffic like objects in natural systems, such as a network of electrical signals traveling in the brain, or complex molecules in a thick liquid bouncing against each other as they are being sucked up through a straw. In all these cases, the objects can together make abrupt "phase transitions" from one state to another -- from a smooth liquid to a molasses-like one, from normal electrical activity to epilepsy, and from free-moving vehicle traffic to a jam. Unlike ice resting in a freezer, these systems are all dynamic, and far from equilibrium. Introduce a disturbance above a critical level, and like a roll of the dice, this can sometimes -- randomly -- cause the system to change its phase abruptly and dramatically. In traditional models, traffic has been treated as having only two distinct phases -- either the cars are moving freely, or they are congested. However, in the mid-1990s, Kerner introduced a three-phase model. There is a “free flow” phase, plus two different phases of congestion -- an all-out "jam," and a state of "synchronized flow" in which vehicles are locked into a reduced speed, such as when vehicles in three lanes slow down together after merging into two lanes. Kerner developed the three-phase model to describe highway traffic in a more realistic fashion, showing how vehicles could move from free flow to synchronized flow to a jam. The model provided insights that led to solutions aimed at improving traffic flow, such as the ANCONA system, in which vehicles await their turn to enter an on-ramp based on precisely timed traffic signals. However, Kerner didn't believe his model, designed for highway traffic, was needed to describe city traffic. "Until 2007, I believed that earlier traffic flow theories and models could explain traffic at light signals in a city network, in particular, traffic gridlock observed almost each day in large cities of the industrial world," Kerner wrote in an email to Inside Science. "I changed my mind only about four years ago." As Kerner discovered, classic traffic models weren't predicting gridlock even at moderate levels of traffic flow. However, in his model, the same chain of events that caused highway traffic to move from free flow to synchronized flow to gridlock in city streets. "I was surprised to learn that Kerner believes that his three-phase theory, which was developed to describe highway traffic, can be applied to traffic on city streets. Once you accept this assumption, the results of his simulations are not so surprising," commented L. Craig Davis, a former Ford Motor Company research scientist who performed traffic-physics research at University of Michigan and Michigan State University. In the new paper, Kerner performs a simulation of a line of vehicles approaching a traffic signal. In the model, cars in free flow can travel at a maximum allowed speed of nearly 35 mph. With a small flow of traffic on a street the model shows that all vehicles at the red light can clear the intersection when the signal turns green. "In accordance with earlier traffic theories and models, gridlock should not occur under these conditions," Kerner explained. Vehicles that pass the green light without stopping can move at free flow speed. However, the line of vehicles can make a transition from free flow to synchronized flow "if one of these vehicles decelerates randomly," according to Kerner. Traffic in synchronized flow has a maximum speed of approximately 25 mph. “As a result, there is a decrease in the number of vehicles passing the light signal during the green light," he explained. This effect increases the number of vehicles waiting in line at the red light of the next cycle of the light signal. Consequently, when this longer line of vehicles cannot clear during the next green light, the line begins to grow. "Traffic breakdown has occurred at the light signal," Kerner stated. Whether a decelerating vehicle ultimately causes gridlock is random, according to the new model. In Kerner’s simulations, a decelerating vehicle sometimes caused vehicles behind it to slow down to a critical speed, compelling them to make the transition to synchronized flow. This In turn guaranteed the emergence of gridlock. At other times synchronized flow, and therefore gridlock, never occurred. "The occurrence of a critical speed for synchronized flow is a random event," Kerner wrote. "[This random occurrence] is a common feature of many other non-equilibrium systems of natural science in which phase transitions occur." While Kerner has done extensive real-world measurements in his earlier research, it's important to note that this work is just at the stage of a simulation. "So far, no one has reported empirical evidence from real city-traffic data that the transition Kerner predicted actually occurs," Davis pointed out. "But if confirmed, it will be an important discovery." With a physical description of gridlock, Kerner plans to come up with ways to break up gridlock in future work. "Correctly understanding the scenario Kerner studied could lead to congestion mitigation," Davis wrote, "perhaps by dynamically controlling the length of the red and green phases of the traffic light. I'm sure that his paper will generate considerable comment and will stimulate further research." In the meantime, Mitchell believes that a lot is up to the driver. People can avoid gridlock conditions if they adjust their schedules, or take mass transit. And if they ever find themselves at a congested intersection, in front of a “stale” green light about to turn yellow, they should try to avoid being part of the problem. "I do think that there is an individual conscious decision to be made whether to move through that green light or sit back and not block the box," Mitchell said.